US Speedskating's Brittany Bowe claimed her second consecutive World Sprint Championship with a pair of first place finishes on the second day of racing at the 2016 World Sprint Championships in Seoul, Korea. “I went into the last race focusing on strong, solid skating and knew if I executed a good race, I would win the title," Bowe said. "I'm honored to hold this title for another year." 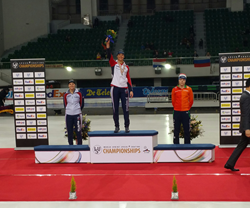 US Speedskating's Brittany Bowe (Ocala, Fla.) claimed her second consecutive World Sprint Championship with a pair of first place finishes on the second day of racing at the 2016 World Sprint Championships in Seoul, Korea. Teammate Heather Bergsma (High Point, N.C.) took second place overall. It’s the second-straight year the U.S. women finished first and second, respectively, at the World Sprint Championships. "I feel very fortunate to have defended my title this weekend here in Seoul,” said Bowe. “Skating one of my best 500-meter races of the year, I was able to take the lead and give myself a three-tenths cushion going into the final 1000 meters. I went into the last race focusing on strong, solid skating and knew if I executed a good race, I would win the title. I'm honored to hold this title for another year." In the women’s 500m (2), Bergsma and Bowe were grouped together in the final pairing with the time to beat being owned by Canada’s Heather McLean at 38.15. Opening the race with a 10.48, Bowe was set the pace between the two U.S. women. Finishing in 37.86, the only women under 38 seconds, she took first as Bergsma’s 38.20 was good for third. Again racing together in the final pairing of the women’s 1000m (2), it was winner takes all. Bowe had a slight advantage out of the gate, but Bergsma owned the lead at the 600m mark. After the final lap, Bowe’s 29.4 was just too much for Bergsma as she crossed the line in 1:15.28 and bested Netherland’s Jorien ter Mors (1:15.35). Bergsma finished third in 1:15.64. Bowe became the third U.S. women to win consecutive World Sprint Championships and first since Bonnie Blair Cruikshank in 1994-95. She is also the first woman since Germany’s Monique Garbrecht-Enfeldt in 1999-2001 to win consecutive titles. Russia’s Pavel Kulizhnikov took the men’s title. Mitch Whitmore (Waukesha, Wisc.) was the top U.S. male finishing 12th overall. Shani Davis (Chicago, Ill.) finished third in the men’s 1000m (2) and 13th overall. Other U.S. overall finishes included Joey Mantia (Ocala, Fla.) in 17th and Sugar Todd (Omaha, Neb.) in 19th. Universal HD will have coverage of the World Sprint Championships on Feb. 28 at 5 p.m. EST. In addition, NBCSN will broadcast an hour highlight show on March 2 beginning at 1:00 a.m. EST. Click here for complete results and to watch the action on demand, visit icenetwork.com.